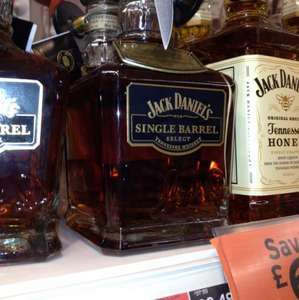 Jack Daniels single barrel whiskey 70cl £28.49 at Sainsburys in store. Normally priced around £37-40. Spotted in the Hanley store earlier today. They also had normal Jack Daniels 70cl for £15. Good price. That's almost like duty free prices? Heat added. Great find. Ive got a £5 coupon off as well. Liked Jack Daniels on facebook and i got sent an email the other day with a coupon. Shock, not stocked on Teesside! Good price though. That's better than duty free actually, just bought some on way back from Caribbean and worked out about £30. Jack have way more in the UK than they used to. I bought a bottle of this at Sainsburys Amblecote at the cheaper price a couple of weeks ago. (it was in a special sale section). But same bottle was priced at full price in the section where it is normally stocked. This should be scalding hot! fantastic price - have never seen it this low, hot!!! looked for the coupon but it seems to have expired "Print limit reached"
Gentleman Jack, which I personally think tastes a lot better is £21 in Tesco - cheapest I have ever seen ! I did not like the single barrel. will have to check the price at some more sainsburys - did it say £37.99 on the shelf? The single barrel for £28.49 is the bottle which has a chain around the neck with a barrel shaped tag with the words "limited Edition specially selected by Sainbury's spirits experts" It has a barcode stickered over the original one with a different ean: 5099873702383. I hope this helps anyone looking to get one for this price. Forest retail park at Thetford has the selected by Sainsbury ones as I finally found it. Scanned at the lower price and they accepted my £5 off voucher. Forest retail park at Thetford has the selected by Sainsbury ones as I … Forest retail park at Thetford has the selected by Sainsbury ones as I finally found it. Scanned at the lower price and they accepted my £5 off voucher. Please can you post the fb link for the 5£ voucher ? Not a link. A xmas voucher from the mailing list. Not available in Scotland due to licensing laws. We still get reduced alcohol deals for single items in Scotland, it's just multi-buys etc that we don't get afaik. For instance Sainsburys did have regular Jack Daniels reduced to £15 per bottle when I was in. I picked up one of these yesterday in Tesco for under 19 quid!!! half price!!!! Was that a Reduced To Clear item though? arent most deals reduced to clear? not sure what you mean...they had some left on the shelf. Yeah and no. Tesco sometimes stick a yellow label on saying Reduced Price, then it'll show the price in large numbers then under that it'll simply read RTC (Reduced To Clear). Which store did u pick it up in please? Didn't know Tesco had this? Only ever seen Gentleman Jacks at Tescos. Picked up two at mine. Yeah and no. Tesco sometimes stick a yellow label on saying Reduced … Yeah and no. Tesco sometimes stick a yellow label on saying Reduced Price, then it'll show the price in large numbers then under that it'll simply read RTC (Reduced To Clear). Which store did u pick it up in please? Saw the boxed ones in one Sainsbury's there normal price. The dog tag ones are on offer. My store had them in the back and not on the shelf so maybe worth while asking if they have any left, if you can't see them on the shelf. This deal is as dead as a dodo. Why is not expired? I've notified it as expired twice. I'm surely not the only one!